Whale Attacker takes the form of two large whales, with descending slopes and spikes along the sides, leading back to a single point, reminiscent of a whale arching out of water, as well as screw head details which serve to add a mechanical feel to the design. In right spin, the large, flat protrusions that represent the whales' heads are the main contact points. These protrusions have a large amount of Smash Attack, delivering impressive blunt force to opponents, but suffering from a debilitating amount of Recoil, requiring the tip of SG Grip Change Base (or other recoil-controlling tips such as Seaborg's own Defense Grip Base in Attack Mode) in order to be worthwhile. Furthermore, the strain on the Attack Ring caused by these extremely violent impacts results in significant breakage issues, particularly near the screw head details where the Attack Ring is at its thinnest (though breakage is by no means limited to this area). It should also be noted that Whale Attacker has a tendency to damage other Beyblades, much like Cross Griffon. In left spin, the most noticeable feature of Whale Attacker is its slopes. These are quite long, however their shallow angle renders them ineffective compared to other proper Upper Attack ARs. Aside from this, the end of each slope, and the spikes along the side of the Attack Ring provide some Smash Attack, but due to the inward curvature of the end-of-slope contact points and the small size of the spiked protrusions (and their tendency to wear down), Whale Attacker is unable to make significant contact in left spin, leading it to be greatly outclassed, most notably by G Upper and Panther Head, both of which combine Upper and Smash Attack far more effectively in left spin. The tip of SG Grip Change Base allows for incredible speed and recoil control, which is important given the extreme recoil suffered by Whale Attacker. The rest of the combination- Wide Defense and and Defense Grip Base 2- allow for the combination to move faster, useful to provide extra force to the hits it makes. This is a deadly attack setup which can knock out all but the toughest defense types with relatively little trouble but the breakage issues of Whale Attacker means this combination is not to be relied on in competitive situations. Defense Grip Base is a mid-height base, with six large screw details extending downward from the upper edge, and a rather pointed profile, leading to a sharp rubber tip. Similar to the later Rubber Sharp Bottom of MFB's Grand Ketos (which also shared the Whale theme), this tip provides excellent Defense and almost no movement, sitting in the centre of the stadium and being extremely difficult to KO, arguably moreso than any other Base, incluing the exceedingly popular SG (Bearing Version 2) Shaft of Wolborg 2. However, while SG (Bearing Version 2) is supported by bearings which successfully address the inherent Survival issues of rubber tips, Defense Grip Base does not compensate for this at all, an issue only worsened by the poor stability of the sharp tip shape. In fact, its stamina is so poor that any Attack custom, even a rubber tipped one, that is able to hit it hard enough to knock it off balance will easily outspin it. It should go without saying, therefore, that any Beyblade with even passable Survival ability will have absolutely no trouble defeating Defense Grip Base, and the extremely passive behaviour of the tip means Defense Grip Base is completely unable to knock these combinations out. Furthermore, as with all other rubber tips, and perhaps moreso due to the softer rubber it is made from, the tip of Defense Grip Base wears down fairly quickly, requiring regular replacement. Due to these issues, it is rarely seen in competitive play in its normal configuration, however, if one lacks top-tier defensive options such as SG Bearing Version 2, or Right Engine Gear (Circle Survive), it is a decent choice for Defense Customization. However, Defense Grip Base does have another, rather surprising use thanks to a simple, legal "modification": by inverting the tip (inserting it upside down from below the Blade Base), Defense Grip Base is given a wide, flat Rubber tip which is excellent for Attack Types. This provides extremely high speed, decent Recoil control, and good controllability with a Sliding Shoot, transforming Defense Grip Base from a mediocre Grip Based Defense BB to an incredibly powerful Smash Attack BB, on par with Grip Base but with added versatility – it is able to use all non-gimmick SG's, allowing for slightly better recoil control and the use of Left Spin Gears. While it does not have the incredible Recoil control of SG Grip Change Base, it doesn't suffer from fragility issues, wears more slowly, and most importantly, is a fraction of the price, and its Recoil control is still sufficient to use some Hyper Aggressive ARs, such as Dragon Breaker with Screw Zeus, which works excellently with the Blade Base using a very light SG and Wide Defense. The other major issue is its tall height, which means getting consistent contact with shorter opponents can be difficult, however banking or using an overhanging Attack Ring like Triple Tiger can overcome this. It also suffers from exceptionally poor Life After Death and poor Survival in general, though this is not a major concern for such an aggressive Blade Base. This means Defense Grip Base is an excellent Attack Blade Base, and unlike other competitive Attack Bases, it is also highly practical, being affordable and easy to find. This, combined with the ready availability of Triple Tiger and Ten Wide means Smash Attack is one of the cheapest types to make a competitive combination for. It should be noted, however, that Hasbro modified the flat part of the tip by removing a section, which causes the Tip to skip when used like this, similar to Metal Fight Beyblade's Quake Bottom. As such, using the Hasbro version of the Tip is not recommended. The combination of Defense Grip Base and a Heavy Metal Core alone is nearly impossible to knock out. Wide Defense provides a circular perimeter making it difficult for opponents to land solid hits on this custom, lending decent weight for Defensive purposes, as well as giving the combination with some much needed Survival ability. Tiger Defenser is chosen for its excellent Defense in right spin, impeccable balance, and strong synergy with Wide Defense. One of the cheapest competitive combinations of the generation, and extremely effective too, capable of standing up even to many Defense Type combinations (an impressive feat in a generation where Defense is so dominant), and easily handling most Compact combinations. However, while the overhanging Attack Ring provides good reliability against lower combinations, it is a serious liability against Circle Survivor Defense combinations, which are very popular in tournaments (and another example of an economical combination). If one expects to face these, using a non-overhanging Attack Ring is a better choice - Mountain Hammer in particular is an excellent Attack Ring for this situation as its abundance of power and elevated contact points ensure hard hits on the vulnerable upper part of those combinations, practically guaranteeing a victory by Knock Out, though more conventional Smash Attack ARs such as Cross Griffon are also moderately effective if launched well. Nonetheless, this setup provides incredible effectiveness at a very affordable price, and is a great choice for Bladers of all experience levels. Defense Grip Base has sufficient Recoil control to use the less Recoil laden Hyper Aggressive Smash Attack ARs, an example of this follows. This is one of the best customs for Defense Grip Base, and one of the best Smash Attack Customizations overall. Dragon Breaker fixes the large, extremely aggressive Screw Zeus in place without obstructing its contact points, and adds a good amount of Smash Attack itself, making an incredibly powerful Attack Ring. While it suffers some Recoil problems, this is not so severe that Defense Grip Base cannot handle it. The lightest possible Spin Gear is used to keep the combinations weight around its outer perimeter as to not weigh it down, increasing speed and the Flywheel Effect (which is why this the perhaps counter-intuitive use of a lightweight Spin Gear in this combination is more effective than adding further weight). Wide Defense provides enough weight to control Recoil against even the hardest to budge opponents, and is a major part of the combination's edge-focused weight distribution. 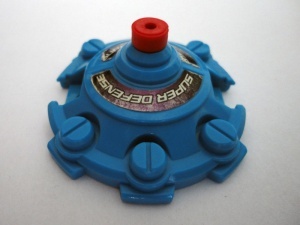 Originally considered an example of how focussing too much on one particular aspect at the expense of all others is a bad idea, the recent clarification that inverting the tip is legal means it now has one of the most practical and effective Blade Bases for Attack Types.As such, all Bladers should own at least one copy of this Beyblade. This page was last modified on 9 August 2016, at 01:08.